We are offering this important title as a new book item in connection with Dolphin Blue. Please see the area below the ordering info for other links related to Mr. Hawken and his book. 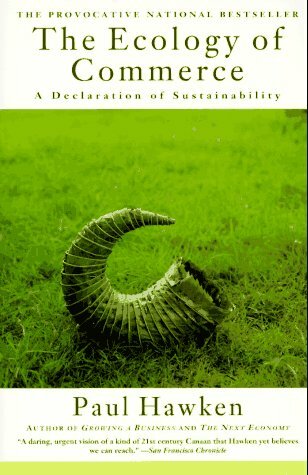 To see a list of other available titles relating to sustainablility and other subjects, please click here. (1) Either send an email asking us to hold a copy this book for you while you send a check or money order made out to Paperbacks Plus to the address below along with your postal address. If you wish to email a credit card number and expiration date, you are welcome to do so. However, if you are concerned about security, please separate the info into different emails. (2) Fax us your credit card info at 214-824-7240 including the expiration date along with your address and the title of the book. Or, (3) call us at 214-827-4860 with your credit card number and postal address. Please let us know that you are calling to order a copy of this book. The postage and packaging charges are for shipment via the US Postal Service's "book rate"/"media mail" for delivery in the U.S., Mexico, & Canada. If it is to be delivered in Texas, please add sales tax of 8.25% on the total including the postage & packaging. If you wish it delivered elsewhere, please specify in your communications to us, and we will get the charges for you and let you know how much difference it makes. Click to see an article describing Mr. Hawken's appearance at The First International Conference on Sustainable Construction. Click to see a review of this book. Click to see a list of Yahoo search results related to this title. To return to Dolphin Blue, click here. To check out Lucky Dog Books and Paperbacks Plus, click here.